I thought my days of being followed by big girls were long over. Then Mary Lee showed up. Maybe you’ve heard about her? She’s the 3,500 pound, 16-foot Great White shark who’s spent the past few weeks cruising up and down the Mid-Atlantic coast, hitting all her favorite eating spots and tweeting about it. Yes, I said tweeting. Mary Lee is a darling of the Twitterverse. More than 65,000 people are following her every move, including yours truly. I wasn’t surprised when she followed me back. Big girls have always found me tasty. Mary Lee is one of hundreds of Great White sharks being tracked by Ocearch, an organization working to protect these sharks. She was named after the lead researcher’s mother. Ocearch tags the sharks with GPS trackers to their dorsal fins. When the fin breaks the surface of the water, the device sends a ping to a satellite which pinpoints the geographic location of the shark. The pings show up on the Ocearch Global Tracker Map, giving scientists a unique look at the lives of these sharks. Mary Lee was tagged off Cape Cod in 2012 and a look at her travel dossier shows she’s basically an East Coast preppie, moving between Cape Cod and northern Florida. She spends a lot of time off the South Carolina coast and has taken a trip to Bermuda. All the Mary Lee hoopla is sort of ironic, I think, given this summer is the 40th anniversary of the movie Jaws, a powerful film when it premiered back in 1975. I remember people screaming and running out of the ocean whenever a school of dolphins swam by. Everyone was talking about the film, so much so that Saturday Night Live even spoofed it with the popular “Land Shark” skit. More than 128 million people bought tickets to see the movie. Jaws is often credited for changing American perceptions about sharks, but that’s not entirely true. Popular fear of sharks actually began after a series of attacks along the Jersey Shore over two weeks during the summer of 1916. Until then, a documented shark attack had never been recorded in the United States. When the first man was killed, newspapers speculated the culprit might be a giant sea turtle or even a big mackerel. A shark was never considered. Eyewitnesses to subsequent attacks identified the killer as a shark. People fled the beaches. This incident was followed by the gruesome story of the sinking of the USS Indianapolis in the Pacific Ocean during WWII. Nine hundred sailors made it off the ship alive, mostly floating in the water in lifejackets, not rafts. The sharks showed up pretty quickly, feasting first on the dead and then on the live sailors bobbing up and down in the ocean. Clouds of blood turned the water red, which just attracted even more sharks. Only about 300 sailors survived the four-day ordeal of drownings, salt water poisoning, and shark attacks. It was one of the worst disasters in U.S. naval history. What Jaws did, however, was vilify the shark in a huge public way, making it okay – a celebration even — to hunt and kill the large “man-eating” predators for sport. When combined with the Asian demand for shark fin soup and other shark products, shark populations dramatically dropped and sharks moved onto the endangered species list. All this has been compounded by the fact that sharks have a long lifespan and don’t breed until they’re at least twelve years old. About 100 million sharks are killed each year. It’s not all bad news for the shark. Another impact from Jaws was that it led to more shark research and an increasing awareness of the importance of the big predators to ocean health. Efforts have been launched to slow down the killing and scientists are saying they’re starting to pay off. 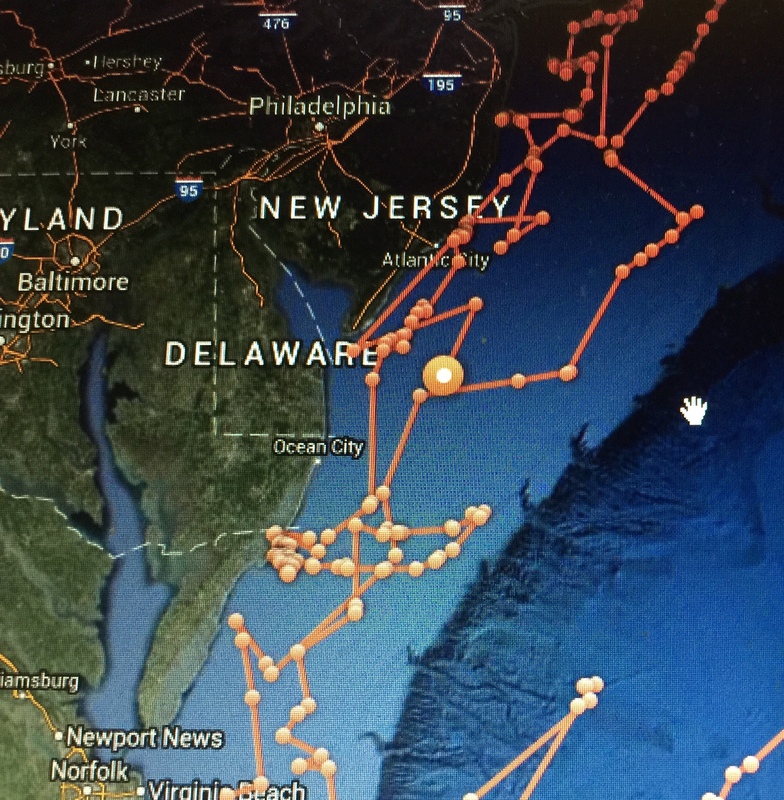 So what kind of sharks do we have off the Delaware coast, you might be wondering? The most common species are Hammerheads, Sandbars, Mako, Smooth Dogfish and the Spiny Dogfish. Delaware Bay is a stopping off point for Sandbar sharks making the trip between their southern wintering and northern summering grounds. Bull sharks are less common, but the most likely to attack people. They are the only species that can tolerate freshwater and are known to venture into bays, harbors, and rivers. Bull sharks were reported in Lake Pontchartrain after Hurricane Katrina. Great Whites like Mary Lee are out there too, but they tend to stay further off shore. If all this shark talk freaks you out, don’t worry too much. There have only been four reported shark encounters in Delaware, none of which were fatal and two of which occurred when sharks were caught while fishing. National Geographic reports that most shark encounters occur in Florida and that you have 1 in 63 chances of dying from the flu as compared to 1 in 11 million by a shark. It also says more people are injured each year by room fresheners than by sharks. I have no idea how one is hurt by a Glade plug in, but I’m going to keep that particular factoid in mind when I’m going for a dip this summer.